Some people asked about this and it seems like it is somewhat of a unknown feature, it's also a bit confusing where to find the correct signature code so hopefully this will help. 1. 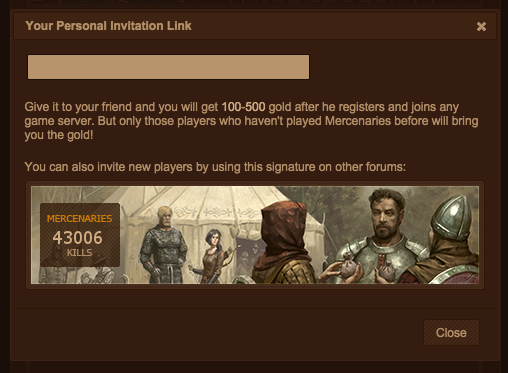 Go to the tavern page and look for the invitation box at the top, click the small '+' icon. 3. Copy the code and go to your forum profile, choose 'edit my profile' and click on the 'Signature' tab. Paste the code in to the box and your signature will now automatically update your current kills. You can also use the signature on other forums and if someone clicks your signature and then registers a character in the mercenaries mod you will get some bonus gold.